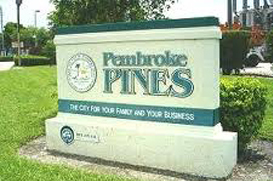 The beautiful city of Pembroke Pines is located in the South Florida metropolitan area in Broward County. With its convenient proximity to nearby cities like Davie Weston, Miami, Miramar and as well as the region’s world-renowned beaches and signature country clubs, Pembroke Pines is a great place for families, retirees and recent college graduates alike. Pembroke Pines real estate offers a bevy of home choices as well as great value. Pembroke Pines real estate consists mainly of quaint single-family homes as well as luxurious condos and stately townhomes. With its wide variety of real estate choices, the city is a great bet for families of all sizes as well as retirees looking for a safe, sunny place to spend their golden years. Elite subdivisions and private communities in Pembroke Pines include the Grand Palms, a gated community that offers world-class golf and recreational opportunities, and also Pembroke Shores and Chapel Trail subdivisions that boasts some of the city’s most magnificent homes. Pembroke Falls is another first-class subdivision, offering fine homes and a scenic, quiet atmosphere in the heart of South Florida. The Broward County Public Schools District serves Pembroke Pines and offers quality public education and some of the region’s best teachers and administrators. Top schools in the district are Pembroke Pines Elementary School, Pines Middle School, Everglades High School and Pembroke Pines Charter High School. Pembroke Pines is home to a robust small business community and plentiful employment opportunities. Key employers and companies in the Pembroke Pines region include the Port of Miami, Johnson & Wales University, Broward College, Exxon, Sony and Oracle. The city of Pembroke Pines is home to attractions and sites of interest such as parks, golf courses and upscale shopping centers. Attractions in nearby Miami and Fort Lauderdale include Bayfront Park, Zoo Miami, the Miami Seaquarium, the Hard Rock Hotel and Casino and pristine beaches.